I promise this will be the last little bit of MLS expansion talk for today – heck – probably for a few months on here. I blame Steve Davis for striking up these thoughts in my head again. I’ve made my thoughts clear on MLS expansion a few times on here already. Most of you know where I stand on things and where I’d like to see the lead head in regards to future clubs. It is a sensitive topic for most of you, because many of you reading are in cities that don’t currently have a MLS team. I get it, you want one, while folks like me sit at a desk that is within a short driving distance to a MLS stadium. You want you city to badly have a MLS team. Believe me I use to be in that boat before I moved to Dallas. 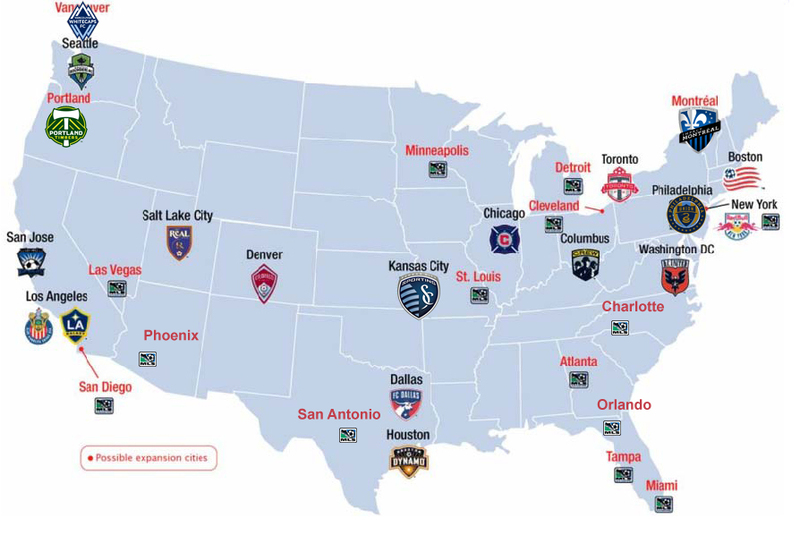 We know MLS wants a team in New York and they’ve stated that being in the southeast is also important. I dug up a lovely map that was used ages ago by the league with their expansion plans. This was way back before the last couple of rounds of expansion hit the league. I had to edit the map a little bit to bring it up to speed but you get the idea. I also threw in a few more cities that weren’t previously mentioned. The original map lacked Orlando, Charlotte, Phoenix and San Antonio. But you get the idea. We know where the league needs to be. The south, the midwest and almost everywhere else in between. But what this all boils down to in most areas is two things, money and stadiums. Without both, you’ll never see a team pop up in any of these markets. As lovely as it would be to have a team in your city, the fact remains it won’t happen anytime soon. I’m looking at you Orlando and San Antonio. Be patient though, it will happen before long, you can count on that. Both of you have more momentum going than anywhere else on this map thanks to your owners (Orlando) and future stadium situations (San Antonio). The main point I want to give out on all of this is to just be patient. The league is young and is still growing. It will come to your town eventually in some form. Think of it like buying clothes for yourself, you want the right fit and look. That is what MLS is doing and has been doing from the start with regards to expansion cities. All are attractive in some respects but some offer the league a better fit than others. That is a fantastic looking map. A+ blog. Might want to add Indianapolis which might be in the NASL. Love bringing back the old map. Feel kind of bad for the large empty section above Colorado. I thought about throwing Indy in there. Good call.